Solomon Northup, “Solomon Northup,” Histories of the National Mall, accessed April 22, 2019, http://mallhistory.org/items/show/244. Solomon Northrup, a free African American from New York, arrived in Washington in 1841 in the company of two white men who had promised him a job as a fiddler. After a day touring the Capitol and White House Grounds, the men drugged him and handed him over to a slave trader. He was imprisoned in Williams' Slave Pen near the Mall, and then sold into slavery for $1,000. He labored for twelve years on a cotton plantation until northern abolitionists, hearing of his plight, obtained his freedom through a series of legal battles in 1853. 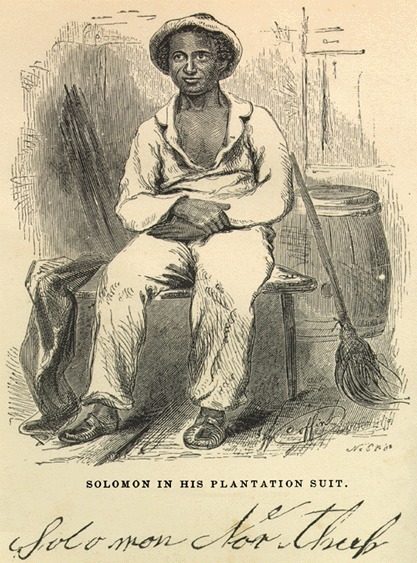 Twelve Years a Slave: Narrative of Solomon Northup (London, 1853). View original document. Northrup was free African American farmer and musician from New York state. He was married with children at the time of his kidnapping in Washington, DC. Following the restoration of his freedom in 1853, he wrote an account of his experience, titled Twelve Years a Slave, published that same year. This drawing of him during his captivity as a slave was one of the illustrations in that memoir. Although he filed suit against the men who kidnapped him, District of Columbia law did not allow African Americans to testify in court, and he lost the case.